This OFF-THE-GRID eco-sustainable rental is your ultimate Algonquin getaway! If you are seeking restitution away from the pressures of everyday living, enjoy "glamping" without the fuss. Our lakefront yurt & cabin are sure to re-connect you back to nature and explore the ultimate Algonquin experience. This “wonderfully, amazing, peaceful & secluded natural oasis” is in the heart of one of Ontario's top tourist areas, just minutes away from internationally renowned Algonquin Provincial Park & Arrowhead Provincial Park & precisely 12 minutes from Muskoka's cultured town of Huntsville. We offer an unlimited complimentary year-round Algonquin/Arrowhead Parking Pass! Pets with up-to-date vet shots are welcome no charge, but advance notice is required. The thought of sitting around a campfire under a clear sky, gazing up at the stars and listening to the sounds of the night can pacify your minds and rejuvenate your soul! During late Spring, Summer and Fall the adjacent cabin compliments the yurt in giving you an additional screened-in porch overlooking the dock. They are both located within meters of each other and you will be assured full privacy on the 11 acres of private property. Our guests are impressed with the vast 75 acre spring fed lake and waterfall just a few meters from the yurt. The lake is virtually undeveloped surrounded with crown land and private ownership with only one other small cottage on the entire lake. Note: the cabin portion is closed off during winter until Spring thaw. 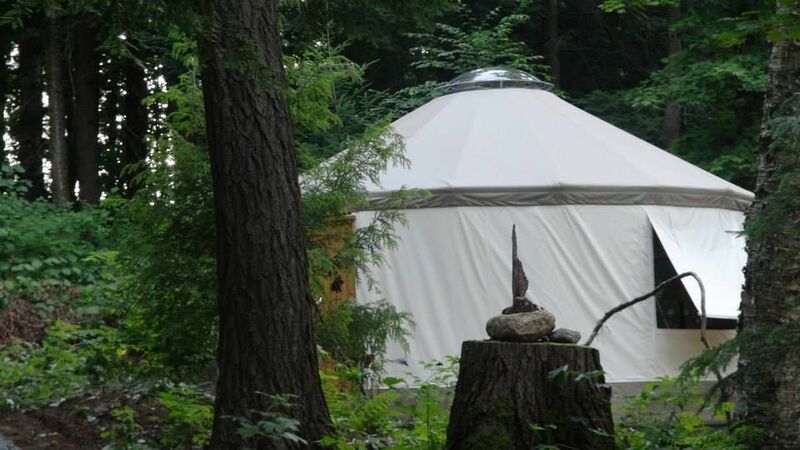 When you arrive to this 100% Canadian made yurt /cabin will be clean & setup with freshly laundered queen size bed sheets, towels, basic cooking utensils, cutlery, plates and a starter supply of paper towels, toilet paper, dish soap & hand sanitizer. This off grid package also includes: unique outdoor privy, BBQ c/w propane, open fire pit, starter supply of kindling /firewood, private dock, waterfall, stream, muskoka chairs, ample selection of games & reading material (for quieter moments), small solar power pack AND canoe, paddles, two standard size life jackets in spring, summer & fall . We include 2 pairs of snow shoes for winter days along with a complimentary Provincial Park Pass. You can safely dive off the T shaped dock (c/w canoe). Its 36ft in length and water depth 7' at the end. The dock is conveniently located only 300ft away from the Yurt. During the cooler seasons,you will be kept snuggly warm even during the coldest of wintery nights inside Yurt's wool lined interior and our new high-functioning wood stove. Its large 17' diameter and 4' skylight makes it the perfect size for a couples getaway! Yurts have developed into great popularity over the past decade, where campers/cottagers can experience a high end upgrade to traditional camping without the work, lately referenced as “glamping”. The sounds of nature is purely therapeutic : ) Other than bringing your basic personal supplies, we do the rest! Muskoka is just a 2 1/4 hour drive north of Toronto. We are located just minutes from historical Huntsville and 30 minutes from the gateway to Algonquin Park, right in the heart of Muskoka District with its vast 2500 square miles of stunning pine and maple forests, 1600 lakes, waterfalls, cliffs and breathtaking scenery! Here are just a few of our many 5 star REVIEWS! We had a wonderful time. The winter experience was truly a memorable one. It's definitely something that we can cross off our list now. We took advantage of the Arrowhead pass and explored the park. We particularly enjoyed skating through the forest. Meeting Doug and Orla was a complete pleasure as well. They were so sweet and welcoming, it made the experience more special. You'll be cooking on propane BBQ with element or over the woodstove for an eco-sustainable pioneer experience! Our lakeside waterfront accommodations are fully accessible by road. Your rental includes a full size BBQ c/w cooking element, fire pit, clean drinking water, and private dock. We offer guests a canoe c/w standard size lifejackets in Spring, Summer and Early Fall and high-tec snowshoes during the winter months :) The lake is perfect to venture out by canoe. This one of a kind accommodation is located on vast 11 acreage of forested private property. My husband and I visited Doug and Orla's yurt to celebrate his birthday, and we could not have been happier with our experience! The yurt is extremely cozy. It is well-furnished, very warm from the wood stove, and perfectly secluded. The bed was very comfortable and we were well rested both nights of our stay. We snowshoed around the perimeter of the lake, which was stunningly beautiful and private. They mentioned there was a fire pit by the water that we were welcome to dig out if we wanted to try, which we successfully did! The property is a short drive from Algonquin, where we hiked the Track & Tower Trail. We can't wait to come back in the warm season to further explore their absolutely magical property! We thoroughly enjoyed our stay. Everything was as described, except that the location was even better than we expected. The yurt was nice and warm even though the weather outside was quite cold. Our hosts were very helpful and kind. Snowshoeing around the secluded lake was a highlight. Recommending this location to all of my friends! We had such a beautiful time. It was magical, warm, and super cozy. The stars are incredibly bright at night, the bed is comfortable, the yurt is very warm. Orla and Doug are lovely. Hoping to visit again soon. Thank you Mary for your wonderful feedback! We agree that this area is an idyllic vacation spot which makes it a perfect magical getaway! We would love to have you return anytime. Always keep touch even though miles separate you. I almost don't want to write a review because I want to keep this place all to my self. If I could, I would make this my full time residents. It's your own private Muskoka, with a beautiful lake and property and nobody else around. The water is clear, clean and refreshing; with fantastic swimming right off the dock. The yurt is clean and comfortable; kind of a hotel room in the middle of the woods. Pictures cannot describe at all how stunning this property is, our expectations were blown away when we arrived, and continued to be exceeded as the week progressed. We did not want to leave! We spent the week canoeing, fishing, hiking, swimming and relaxing all without leaving the property. My two dogs had a blast with so much space. My senior dog (13 year old) was a puppy again and was actually running, and my puppy matured and learned so much; from how to canoe, swim and enjoy a campfire. I recommend this vacation spot for anyone. Whether you are an avid back country camper, or have never left the city you will find this a perfect get away. The yurt is very cozy and comfortable, the lake serene ... a great place for a quiet holiday. Very nice. Will recommend to family and friends. What a fabulous expression to describe Lakeside Yurt!. Its fulfilling when we hear our guests are passing along references to family and friends. It means a lot to us. Thanks again for staying with us, and please do think of us if your travels bring you northward bound. Muskoka is just a 2 1/4 hour drive north of Toronto. We are located just 12 minutes from historical Huntsville and 30 minutes from the gateway to Algonquin Park, right in the heart of Muskoka District with its vast 2500 square miles of stunning pine and maple forests, 1600 lakes, waterfalls, cliffs and breathtaking scenery! Cancellation Policy: You can book with assurance : ) Your deposit can be applied to another reservation made at the time of the cancellation for your stay period anytime within the next 12 months. If full payment has been paid, the Owner will make every attempt to re‐book your reservation: if the reservation is re-booked at the same rate, you will be FULLY REFUNDED at 100% If the reservation cannot be rebooked, then Homeaway conditions apply. To date , we have an excellent success rate in re- booking as we offer last minute sales on depositors behalf!